These prices are effective February 1, 2019, and are subject to change without notice. The goods and services shown below are those we can provide to our customers. You may choose only the items you desire. However, any funeral arrangements you select will include a charge for our basic services and overhead. If legal or other requirements mean you must buy any items you did not specifically ask for, we will explain the reason in writing on the statement we provide describing the funeral goods and services you selected. Please note that there may be additional charges for items such as cemetery fees, flowers, and newspaper notices. We believe in complete transparency in all we say and do. 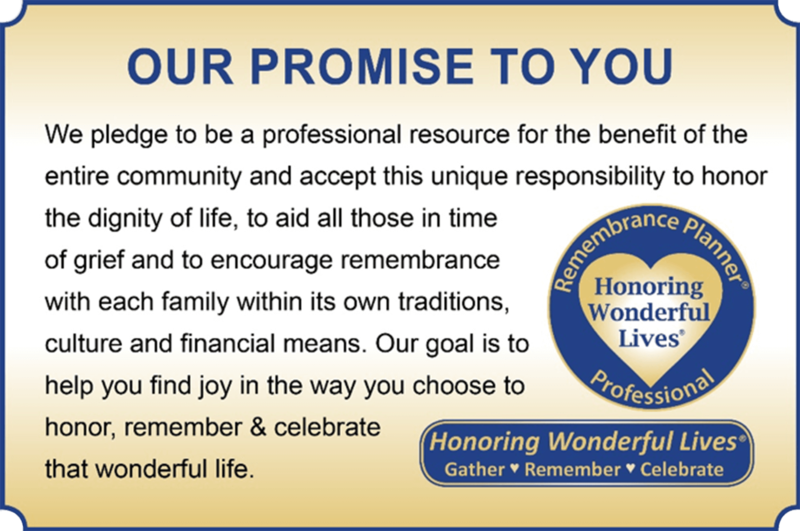 That is why we are the only professional funeral provider in La Porte County that provides online pricing. The itemized price list below is a requirement of all funeral homes nationwide. Upon request in person, a funeral home is required to give the consumer this itemized general price list. Coordinating service plans with cemetery, crematory, churches, florists, newspapers, etc. This fee also includes a proportionate share of our basic overhead costs such as facility maintenance, administrative and secretarial costs, insurance, utility expenses, equipment, inventory, and governmental compliance costs, etc. *Travel outside local area of 25 miles: $3 per loaded mile. Standard Visitation Hours: 3-7 PM Monday thru Saturday, 1-4 PM Sunday. Providing and staffing a time of visitation and gathering at our Funeral Home or facility of your choice. Includes setup and use of viewing areas, lounge areas, display of floral arrangements and all personalization items, service attendant to assist the family and guests. Standard Service time, includes 1 hour of visitation prior to service: 10 or 11 AM Monday thru Saturday, 12 PM Sunday. Providing and staffing a traditional funeral service at our Funeral Home or facility of your choice. Includes placement of encased remains, display of floral arrangements and all personalization items, service attendant to assist the family and guests. Providing and staffing a memorial service at the location of your choice or at our Funeral Home, display of floral arrangements and all personalization items, service attendant to assist the family and guests. Providing and staffing a traditional graveside service at the cemetery, display of floral arrangements and all personalization items, service attendant to supervise graveside service and assist the family and guests. Use of our Private Gathering Room for a private goodbye. We offer minimal preparation of your loved one for up to 20 family members (up to 30 minutes without embalming). Does not include cremation container or casket for viewing purposes. Room may not be available due to scheduling. Catering is additional. Includes any visitation, funeral service, or memorial ceremony that occurs on Saturday or Sunday. Includes services of Funeral Directors and staff, a proportionate share of overhead costs, transfer of deceased to funeral home, embalming, transport to nearest airport (Ceremonies, casket or shipping container is not included). Includes services of Funeral Directors and staff, a proportionate share of overhead costs, and transportation to local cemetery or crematory. (Local ceremonies, casket or urn, transportation from the airport is not included). Preparation of papers, securing permits, and funeral director supervision for local disinterment. Does not include state fees, grave digging/cemetery charges, mileage, ceremonies, or additional services. Includes, but is not limited to, services of funeral directors and staff, a proportionate share of overhead costs, transfer of your loved one to Cutler’s, obtaining necessary authorizations, consents, 48 hours refrigeration, transportation to the crematory. If you want to arrange a direct cremation, you can use an alternative container. Alternative containers encase the body and can be made of materials like fiberboard or composition materials. The containers we provide are cardboard and fiberboard. Cremation Fee (see below) will be added to the above cost. Varies from city to city and cemetery to cemetery. Certified copies may be ordered at any time in the future from the city or county in which the death occurred. Prearranging a funeral is a wise thing to do. We want to make sure that you fully understand the terms of a prepaid contract and how your funds are protected under Indiana law. 1. Your funeral director does not get to keep your money. By law, your preneed funds must be deposited and held in a trust. 2. Your preneed contract is irrevocable after 30 days. You cannot cancel your contract after that point and no one can take any money from the trust except at time of death. 3. The funeral services and merchandise listed on your contract are guaranteed. The growth interest and dividends) on the amount held in trust will remain on deposit to cover future price increases. If at the time of death, the amount in the trust is less than the funeral home’s current retail prices, they must provide the services and merchandise shown on the contract and accept the loss. In exchange for assuming this risk, if the amount held in the trust exceeds their current retail price, they may retain the excess funds. You and your family will not be required to pay any additional amount to obtain the funeral services and merchandise you selected. 4. Cash advance items (charges made by cemeteries, newspapers, and other third parties) on your contract are only estimates and are not fully guaranteed. A percentage of the earnings on the trust will be credited towards the amount on deposit for these items, but if there is a shortfall, your family will be required to pay any difference. 5. Your contract is transferable to another funeral home in the event you move or otherwise must change funeral homes. In order to accept the transfer, the newly selected funeral home must honor the terms of the contract and guarantee to provide the funeral services and merchandise you originally selected. IF YOU HAVE MADE PRE-ARRANGEMENTS AT ANOTHER ESTABLISHMENT, YOU CAN CHANGE TO CUTLER'S. YOU DO NOT NEED TO DO ANYTHING. WE CAN ARRANGE TO TRANSFER THE PRE-PAID TRUST BEFORE OR AFTER THE DEATH OCCURS. WE WILL HONOR OTHER LOCAL AND NON-LOCAL FUNERAL HOMES PREPAID FUNERAL PLANS WHICH ARE VALID AND ARE CURRENTLY IN FORCE.